The media, your pediatrician, politicians and health authorities like the CDC and FDA claim that vaccines are safe and effective. So why do hundreds of peer-reviewed studies indicate the opposite is true? 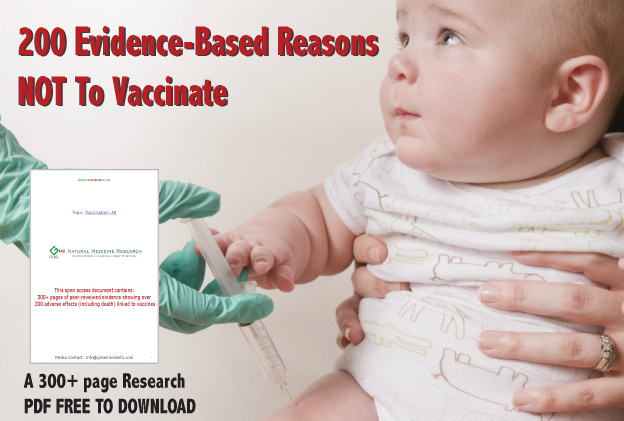 Read, download, and share this document widely to provide the necessary evidence-based counterbalance to the pro-vaccination propaganda that has globally infected popular consciousness and discussion like an intractable disease. It is abundantly clear that if the present-day vaccine climate, namely, that everyone must comply with the CDC’s one-size-fits-all vaccination schedule or be labeled a health risk to society at large, is to succumb to open and balanced discussion, it is the peer-reviewed biomedical evidence itself that is going to pave the way towards making rational debate on the subject happen. With this aim in mind, GreenMedInfo.com has painstakingly collected over 300 pages of study abstracts culled directly from the National Library of Medicine’s pubmed.govbibliographic database on the wide-ranging adverse health effects linked to vaccines in the today’s schedule (over 200 distinct adverse effects, including death), as well as numerous studies related to vaccine contamination, and vaccine failure in highly vaccine compliant populations. This is the literature that the media, politicians and governmental health organizations like the CDC, pretend with abject dishonesty does not exist – as if vaccine injury did not happen, despite the over 3 billion dollars our government has paid out to vaccine injured through the National Vaccine Injury Compensation Fund since it was inaugurated in 1986. We have written extensively about this research previously, highlighting different studies, focusing on translating their implications to the lay persons (view our vaccine article section here), but we believe that collecting and condensing solely the primary literature itself makes a much more powerful statement. Major media aren’t giving this story the coverage it deserves. I certainly am. Short question: Can a person sue a US vaccine manufacturer? Short answer: Under certain conditions, yes. Note: I’m not framing this article as professional legal advice. I’m reporting what I’ve been able to dig up on a very explosive issue so far. I’ve communicated with two lawyers and a law professor. I’ve been pointed to an important passage on a federal web page. Right now, lawyers and their clients are suing Merck, the manufacturer, for injuries incurred from Merck’s shingles vaccine, Zostavax. Among the claimed injuries: contracting shingles; blindness in one eye; partial paralysis; brain damage; death. One of the plaintiffs’ attorneys told me he has already filed two cases in California. Each case has 50 plaintiffs. He states he has 5000 clients waiting in the wings. There are other attorneys with other plaintiffs. But wait. Isn’t there a federal law that bars people from suing vaccine manufacturers? Isn’t that law the 1986 Childhood Vaccine Injury Act? Doesn’t it demand that people go to a special federal “vaccine tribunal/court” and plead for compensation from the government? Aren’t vaccine manufacturers shielded from liability for causing injury? Well, it turns out there are exceptions to the rule. Adult vaccines are not part of the 1986 federal law. The law shielding vaccine companies only applies to childhood vaccines. The Merck shingles vaccine is only for adults. The special federal “vaccine tribunal/court” is established as part of the National Vaccine Injury Compensation Program (VICP). This is where parents who claim their children were injured by vaccines must go, to ask for compensation from the government—not from vaccine manufacturers. What does “covered” mean? It means “covered exclusively by the federal compensation program.” It means a parent who believes her child has been injured by a vaccine goes to the special federal “court.” The vaccine must be FOR CHILDREN. However, an adult seeking compensation for vaccine injury, FROM AN ADULT VACCCINE, would, with a lawyer, argue his case in ordinary state or federal court. That adult would sue the vaccine manufacturer. This message from the federal government is clear. The ban against suing vaccine manufacturers only applies to vaccines recommended for children (and pregnant women). The ban does not apply to adult vaccines. The CDC claims the shingles vaccine is safe, but a letter the FDA wote to Merck paints a different picture. I recently wrote about the news of a suit against Merck over damage from the shingles vaccine. 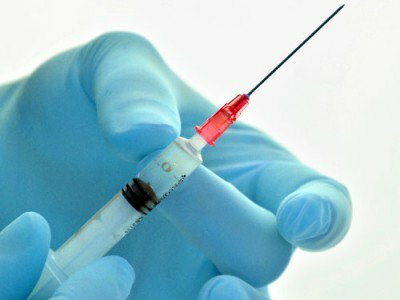 There are claims of serious side effects, including death associated with this vaccine. KP Stoller, a physician in San Francisco and author of the book, Incurable Me (Skyhorse 2016), is a strong critic of the current vaccine program because of its lack of safety science and oversight. He has coined the word Adversonomics to describe this neglected area of vacinology. I asked him about the safety of this vaccine. A. There is ZERO credible safety data on “vaccines” [defined as (adjuvants etc. + antigen)] when there are no saline vs. vaccine comparisons have been done. Vaccines are not tested for safety against a saline placebo, they are tested against a solution that contains all the adjuvants, metals, DNA, and other toxins etc. but just minus the infectious disease antigen itself – in this case the varicella virus. So, the safety data and adverse event data Merck cites in their package insert does not have a lot of meaning. It would be the same as if Monsanto tested RoundUp for safety and compared it not to water but to RoundUp sans Glyphosate (the reported active ingredient). Even without Glyphosate, RoundUp is very toxic… one of the ingredients is 10,000 times more toxic than Glyphosate itself. Would comparing those two substances RoundUp with Glyphosate vs RoundUp without Glyphosate be a fair comparison for safety purposes? Yet that is exactly what the vaccine manufacturers are allowed to pass off as an adequate safety comparison. RoundUp without Glyphosate isn’t anymore a placebo than the varicella vaccine without the varicella. Q. 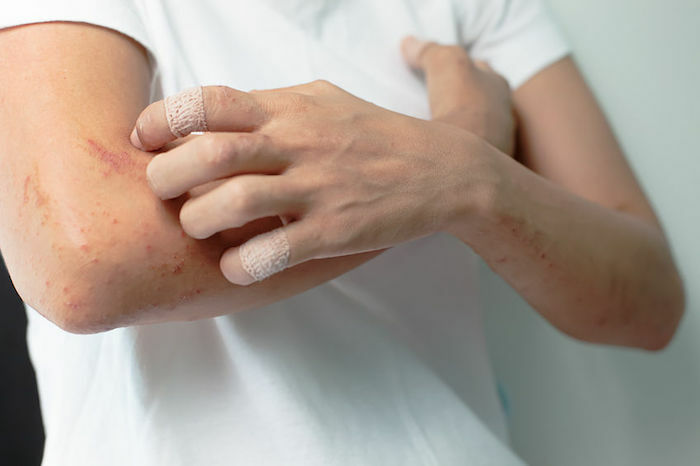 What is the connection between the live virus chicken pox vaccine, now universally recommended for every child, and shingles in the adult population, which Merck claims will affect one in three adults in their lifetime.? A. It has been two decades since the USA implemented Universal Varicella (Chicken Pox) vaccination. And we now know a whole lot more information about what this program has caused because what happened when children are no longer circulating wild Chicken pox virus (varicella or VZV) in the population is that adults who once had VZV as children but were unable to eradicate the virus completely from their bodies are no longer exposed to the wild virus and their own immunity drops. When these adults lose their immunity to the virus, it comes out of its hiding places (the body’s dorsal-root ganglia) and that adult develops herpes zoster (HZ). Before VZV vaccination there were about 4 million cases per year and 1 million cases of HZ. Fifty children would die each year from complications (90 people die each year from lightening sticks just as a point of reference). Now, initially the vaccine was found to be very effective but that was because not everyone was vaccinated so those that were vaccinated kept getting their vaccine induced immunity boosted by the wild virus just like the adults were keeping the HZ at bay for the same reason. Ten years after its introduction the efficacy of the vaccine had dropped to less than 60%, because there were almost no unvaccinated kids circulating the wild virus. At the same time HZ cases among adults went up 90%. Big Pharma’s ever ready answer was to vaccinate the adults to replace the natural immune boosting presence of circulating wild virus. The cost of vaccinating adults with a VZV vaccine to achieve protection close to that which occurs naturally when VZV incidence could cost as much as $40 billion dollars – that is a lot a chicken scratch to Big Pharma for a vaccine that wasn’t really needed in the first place. I know Ty Bollinger and his team have an amazing 7 days queued up, and I’m so excited to see it… on so many levels. For one, this topic is heating up in the halls of Congress right now, with vaccine safety concerns once again surging, particularly for young children and seniors. And two, this thing is going to be chock full of helpful information on this topic that I know will make a difference for you and your family. 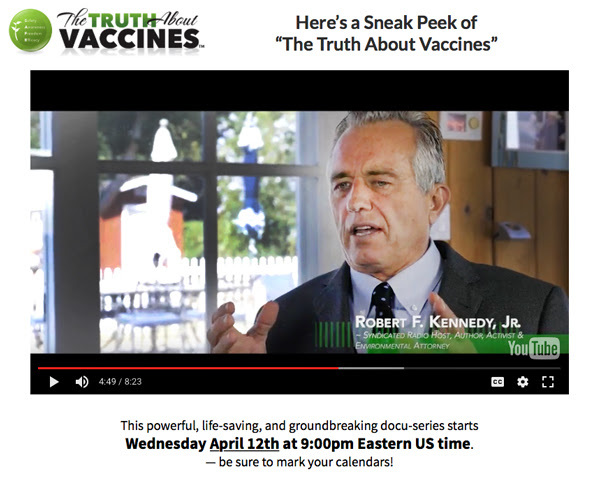 Regardless of your position on vaccines, I encourage you to register to watch this series. This series is about getting the facts (and the full story that’s not being told), and understanding what all your options are. Taking the time to get educated and get the facts will bring you peace and confidence, knowing how to best care for yourself and your family and keep them safe. P.S. – If you scroll to the bottom of that page, you’ll see a place where you can register to watch the entire series for FREE. Episode 1 – Airs on April 12th at 9:00 P.M. EDT sharp! What’s in a Vaccine? Are Vaccines Effective? … and … What About Polio? Each episode will be available for 24 hours online for you to watch, then it’s taken down to put up the next episode. Let’s share this lifesaving event with every parent you know!! !